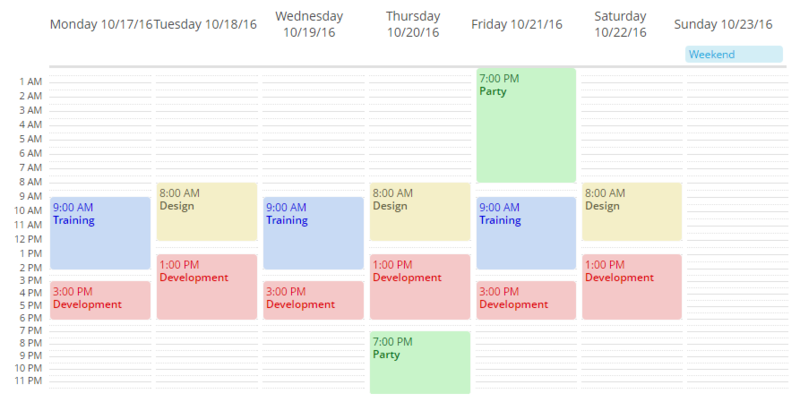 The Calendar component is intended to organize and display calendar events. XML-name of the component: calendar. The view mode is determined from the date range of the calendar, defined by the start date and the end date. The default view is the weekly view, it is used for ranges up to seven days a week. For a single-day view use the range within one date. 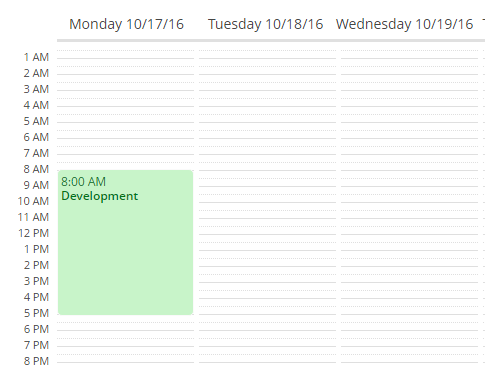 Calendar will be shown in a monthly view when the date range is over than one week (seven days) long. endDate - the end date for the calendar’s range. endDateProperty - the name of an entity attribute that contains the end date. descriptionProperty - the name of an entity attribute that contains the event description. isAllDayProperty - the name of an entity attribute that determines if the event is all day long. startDate - the start date for the calendar’s range. startDateProperty - the name of an entity attribute that contains the start date. stylenameProperty - the name of an entity attribute that contains the event style name. timeFormat - time format: 12H or 24H. There are two data providers available: ListCalendarEventProvider (created by default) and EntityCalendarEventProvider. EntityCalendarEventProvider is filled with data directly from an entity fields. To be used for the EntityCalendarEventProvider, an entity should at least have attributes for the event start date (DateTime type), event end date (DateTime type) and event caption (String type). addWeekClickListener() - adds listener for week number clicks. addEventClickListener() - adds listener for calendar event clicks. addEventResizeListener() - adds listener for event size changing. addEventMoveListener() - adds listener for event drag and drop. addForwardClickListener() - adds listener for calendar forward scrolling. addBackwardClickListener() - adds listener for calendar backward scrolling. addRangeSelectListener() - adds listener for calendar range selection.